Everybody loves to receive gifts! It develops a beautiful relation between the recipient and giver. People love to give gift card vouchers and coupons as gifts to their beloved friends and relatives. It allows the recipient to choose the items which they like. Chungath Gift Vouchers are available on different denominations starting from Rs 500. 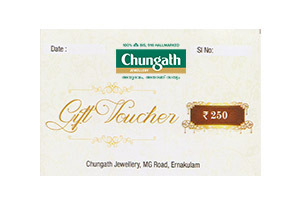 This Gift Voucher is redeemable at all Chungath Jewellery showrooms in Kerala and Dubai. Multiple gift cards can be used for a single transaction. The gift voucher can be redeemed only once. This jewelry gift vouchers can be used for the purchase of gold/diamond/precious, platinum and silver ornaments. The validity of the voucher is 12 months; however we will ensure that the voucher reaches you with minimum 10 months validity. So that you can earn points for gift cards. Rush. Earn Chungath gift cards!